Yext, a popular local business search engine that for some reason managed to stay under the radar so far, is launching a new product dubbed Yext Calls at the TechCrunch50 event today that’s bound to raise some eyebrows. Local businesses can use the Yext Calls software to process incoming phone calls and organize them based on semantic analysis of what was said during the conversation, providing them with an easy way of searching or browsing through them at any point. Based on keywords that occurred in the call, the software can detect that e.g. price estimates were requested for a car repair or which part of what type of vehicle the caller was having problems with exactly. The program can even automatically detect if any appointments were made during the conversation, giving the local business owner or representative an easy way of scheduling their calendar based on relevant keywords that were used during the call. Ultimately the analysis of the phone calls helps Yext make their flagship product, the local business search engine which they claim gets visited by over a million users a month, more detailed for visitors and at the same time more effective for listed companies. Basically the data that gets drawn from the phone calls analysis helps business owners get more qualified leads via the search engine. The way this works is that a local business owner can indicate that a call was relevant to his core business by giving it ‘thumbs up’ or ‘thumbs down’, which in turn leads Yext to better decide if they want to show the company in the results when a specific keyword gets used in a search or not. I personally think this is a great way for Yext to automate the improvement of their search engine’s accuracy while at the same time providing huge direct and indirect benefits for local business owners. It also helps that the service is basically free and listed customers only pay per call received. Q – Roelof Botha: who transcribes the phone call? A: the answer is: we leverage several core platforms, totally automated. The business answers the phone calls. Q – Roelof Botha: are you helping local business with their SEA/SEM campaigns too? A: our partner network takes care of that side of the equation. Q – Paul Graham: you already have an existing business that’s making a lot of money? A: Yes, $20 million in revenue and growing fast. But we are a startup, expanding into a new territory: pay-per-action phone calls. We only charge for actions that are relevant to the local business owner. Q – Roelof Botha: how do you convince business owners of your value proposition? A: it’s an end-to-end solution for them to advertise smarter on the Web. Q – Marc Andreessen: is there adverse selection? are the merchants who are most likely to want phone calls least likely to get the web to get them? A: We found most merchants overall prefer to receive phone calls. Q – Paul Graham: why local business, and not national ones? A: Some are suited for that, but mostly if they work with local dealerships for example. We focused on Yellow Pages categories. Q – Paul Graham: What’s the biggest of the 12 categories you support now? TC50: Yext transcribes, searches phone calls for local businesses VentureBeat. 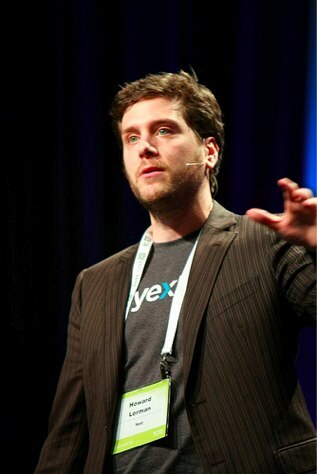 Yext(TM) Launches First Ever Pay-Per-Action Phone Call Service at TechCrunch50 Reuters. Yext launches Yext Calls service at TechCrunch50 TelecomPaper.